I am looking for a clean and fast method to force GNOME in Ubuntu 14.04 to switch between active apps only on the current workspace when pressing the shortcut alt + tab. As an alternative to installing dconf-editor and having to fiddle around with your mouse so much, you can also do this from terminal. I would like dconf-editor more if it could search through paths, properties, and values. If you also want to ungroup applications on switcher you can add officially supported AlternateTab extension. Actually, Ubuntu is going to have the Alternatetab as default on Alt+tab in the upcoming version of Ubuntu (19.04), while the current default app switcher will remain on Super+tab. An alternative for people who want to tab through open windows on current workspace but also want to be able to tab through all open apps (on any workspace) this can be achieved by changing the keyboard shortcuts. The other solutions here did not work for me on Ubuntu 18.04.1, but the Alt Tab Workspace extension worked. Not the answer you're looking for? Browse other questions tagged shortcut-keys workspaces gnome-shell application-switcher or ask your own question. 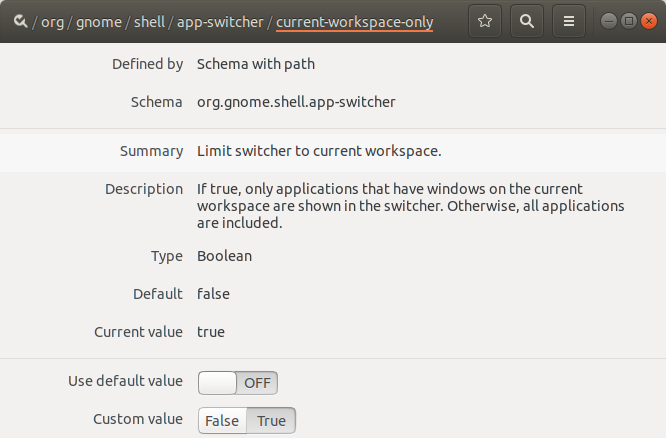 How to switch between applications in current workspace only in gnome-shell? How do I separate windows per workspace in Ubuntu 18.04? How can I configure `Alt-Tab` to show only windows from the current workspace? Unity: How do I revert Alt-tab behavior to switch between windows on the current workspace? How can I set that Alt-TAB to switch windows only on the current workspace? How do I easily switch between windows rather than applications with Alt+TAB in GNOME Shell? How do I make alt + tab cycle through individual windows only in current workspace in GNOME 3?